Color Cop is a color picker for both programmers and web designers. It has the ability to represent colors in different hex color code formats. You can drag the eyedropper control to any screen location and release. The hex color code for the selected color will be automatically copied to the clipboard. - Eyedropper Just click and drag the eyedropper anywhere on the screen to select a new color. Single pixel or 3x3/5x5 average sampling options are available. - Magnifier This control works exactly like the eyedropper. It can be used to zoom in on an area of the screen. After zooming, you can click in the magnifier view to select a color. The plus and minus buttons can be used to change the magnification level before or after magnifiying an area. - Auto-copy to clipboard With this option enabled, the output value will automatically be copied to the clipboard. - Relative position measuring Press the Control key while eyedropping and the coordinates will be set to zero (0,0). When you drag the mouse to a new location, the coordinate values will be relative to the point. - Color History The last 7 colors selected will appear in the color history. To select a previous color, simply click on it. Colors can be pushed into the color history by right clicking while eyedropping. 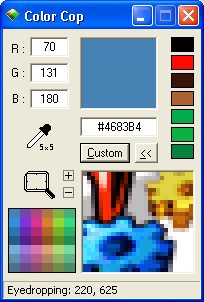 - Complementary color palette 42 colors that complement the current color will be generated on the fly. - System tray support The application can be minimized to the system tray. - Mouse wheel support Spin the mouse wheel while magnifying to change the magnification level. Spinning the mouse wheel while focus is on either of the Red, Green, or Blue edit controls will increment or decrement by 1(hold shift for +/- 2, hold control for +/- 5). - BMP to clipboard - Double click on the magnifier's window and it will prompt to copy the the bitmap to the clipboard.